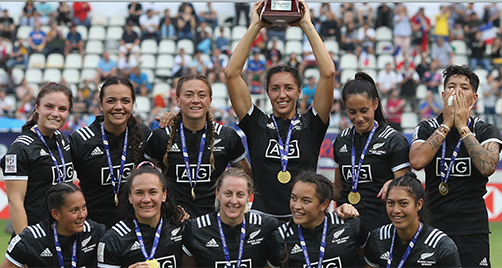 The NZRU’s expressed intention to host a round of the World Series takes a step closer this weekend when they host the “Fast Four” tournament women’s during the men’s World Series in Hamilton. With Australia turning down an invitation to take part (preferring to play a domestic Probables vs Possibles series of the weekend), the tournament will now include England, France and China as well as the home team. So far only England have announced their squad for Hamilton, which comes just a week before the Sydney Sevens and are using it as an opportunity to give Megan Jones her return to international rugby sevens after recovering from injury last season, and a debut for Lizzie Adam. In addition, Emma Hardy will also travel to her first international tournament as the injury replacement since signing for England after Ellie Kildunne was made unavailable due to injury. “The introduction of a new women’s invitational tournament this season is not only a brilliant step forward for the development of the women’s game but it’s also a great opportunity for us to get some competitive game time before the next World Series leg in Sydney,” said England head coach James Bailey. “New Zealand, France and China are all very tough sides so the level of competition is going to be high and there will undoubtedly be a lot that we’ll be able to take out of this tournament and apply to the rest of the season as we continue to grow and develop. England squad for Hamilton: Lizzie Adam; Holly Aitchison; Claire Allan; Abbie Brown ©; Abi Burton; Deborah Fleming; Megan Jones; Alex Matthews; Celia Quansah; Helena Rowland; Emma Uren; Amy Wilson Hardy. "Playing the Black Ferns is always an honour, a real opportunity and a recognition to measure oneself against the best. This is the first time a French women’s team has been invited to New Zealand: it was a chance to seize and could not be refused! New Zealand is ultimate when playing rugby. It is a country totally dedicated to the practice of this sport and sometimes innovative in its organization. It is with great pleasure that we will take up the challenge and the invitation is a fair return for the project put in place for ten years. " "The last time we met them was during the World Cup final last summer, and it probably says a lot about the respect they now show us - and it is of course totally reciprocal. "Hamilton will also allow us to get over the time difference and jet lag, to work on the spot and to prepare for Sydney, which remains our number one objective. Hamilton tournament is really just preparation, but ideal to get ready for the tournament in Sydney and of course build experience for the second half of the season. Let's remember that we are in a year of Olympic qualification, what better than to face the World Champions and the best nations? " New Zealand have also yet to announce but are expected to use the tournament to give their three new squad members in the new 2019 Ferns squad - Jazmin Hotham, Mahina Paul and Montessa Tairakena – a taste of the international game, though stars such as Michaela Blyde seem certain to appear as well, and coach Alan Bunting emphasised how important Hamilton is: “The first focus is Hamilton, which is awesome for us to play at home for the first time and you can see all the players can’t wait to get there”.